For our latest Bulletin click here. Twenty six of us enjoyed a day out at Highclere Castle, travelling from Paddington to Newbury by train and then by coach to the castle itself. We all visited the gardens and house and many of us also explored the Egyptian exhibition. The gardens are quite beautiful, with a variety of features including a wild flower meadow, Monks garden and secret garden. There is also a memorial to a plane crash in World War Two. 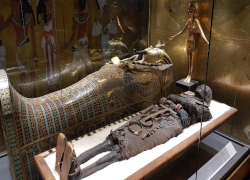 The fifth Lord Carnarvon was a sponsor of Howard Carter and there was an exhibition portraying the discoveries in Egypt that flowed from this, with a replica of Tutankhamun's tomb and the mummy itself the central features of this exhibition. Carnarvon died in Egypt shortly after the discovery of the tomb, lending further credence to the theory of a curse. We also spent a considerable time in the magnificent house which is resplendent with paintings, furniture and other artfefacts representative of the history of its occupants. The castle is the third manifestation of a structure on this site. The first written records of the estate date back to 749 when an Anglo-Saxon King granted the estate to the Bishops of Winchester. Bishop William of Wykeham built a beautiful mediaeval palace and gardens on the park. Later on, the palace was rebuilt as Highclere Place House in 1679, when it was purchased by Sir Robert Sawyer, Attorney General to Charles II and James II and direct grandfather of the current Earl. In 1771 'Capability' Brown made plans for the alteration of the grounds, water and symmetrical Georgian house at Highclere for the 1st Earl of Carnarvon, the 8th Earl and Countess of Carnarvon. Travel back to London was “uneventful” and the Outing a great day out. For previous Outing reports see lower down this page. 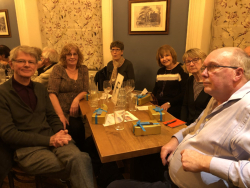 We held our annual pub quiz in February 2019 and for a change held it in the Canonbury Tavern. As always it was well supported with 58 members buying a ticket for the event. A number of members meet beforehand to eat at the Tavern and then we took up our team places upstairs. Again we were using Jez Worsnip as our professional quizmaster for the evening. Jez designs the questions especially for iU3A and of course the judges' word is final! As always it's a great opportunity to test the grey matter and get to know other members. Ten teams battled it out with mixed fortunes. The musical round had caused some pains to most teams and there was a clear leader. In the second half the favourites (Team: 'F' Word) lost some ground but were still clear winners. So another successful event enjoyed by all. Thanks to Anne, Ann, Mary, Kathryn and Christine for organising the event. We are all looking forward to next year's already. Our March speaker was Robin Weiss, who told us about the ‘Two Gentlemen of Verona’ — two physicians/scientists with strong links to Verona, who, despite living hundreds of years apart, contributed immensely to our understanding of how diseases are transmitted. The first man was Girolamo Francastoro (1478-1553) who became aware of syphilis in 1494 when it was brought back by the Italians from the West Indies and transmitted backwards and forwards across the seas as explorations continued. The disease was virulent and reached epidemic proportions. Francastoro discovered that tiny particles could transmit infection by direct or indirect contact over long distances. He recognised that the disease had a latent period and that it was sexually transmitted. Inevitably it was foreigners who were blamed for the disease but wherever Europeans travelled the death of natives ensued and the disease had a huge impact on native populations. There is a portrait of Francastero in in the National Gallery which has been recently attributed to Titian, speculation being that he painted the portrait in exchange for treatment for syphilis. The second ‘gentleman’ was Domenico Antonio Rigoni-Stern (1810- 1885), who contributed to our understanding of the spread of cancer. He discovered that cervical cancer was more common in married women and widows than in nuns and virgins and that celibate women were more likely to suffer from breast cancer than sexually active women. He linked this to the fact that pregnancy can be a protective factor in the prevention of breast cancer. His thinking was way ahead of his time and his findings mark the birth of cancer epidemiology. We overran due to all the ensuing questions from the audience showing that the talk had provided a fascinating insight into early medical research. For information about our previous monthly talks see here. On 22 November iU3A held its AGM. The annual accounts were presented and five members elected on to the Executive Committee to replace resigning members. You can see all the subjects addressed here. In October our Open Day was also our fifth birthday celebration. Again this proved very popular and enabled non-members to meet us and find out about all the things iU3A does. As in previous years there was an excellent turnout with over 200 attending (151 members and 50 non-members). Out of the 50, 23 joined iU3A on the day and many others took away forms, so we hope to hear from them again soon. 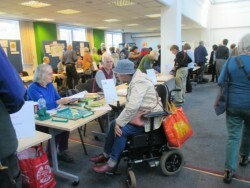 The existing members who turned up used the chance to see what other groups were on offer and sign up to them. Everybody also enjoyed our delicious birthday cake and had a good natter. This year the 'star' who cut our birthday cake was our acting Vice Chair, Ruth Gee. With over 60 interest groups on display there were many great displays. Eight potential new groups were also being advertised to gauge interest and support. Visible and audible displays charmed the audience as they strolled around. 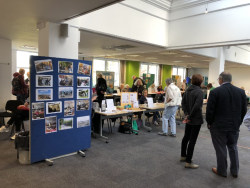 All the existing Group Coordinators and their helpers did an excellent job of explaining what their group did and hence encouraged many to sign up. Hopefully this exercise also encouraged more members to be brave enough to volunteer to be Coordinators. 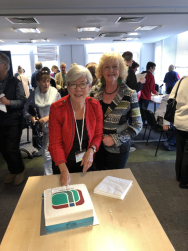 A special thanks must go to the sub-committee which organised another successful day, particularly to Sue Welsford, Diane Austin, Margaret Wearing and Isabel Dickson for coordinating the whole event. 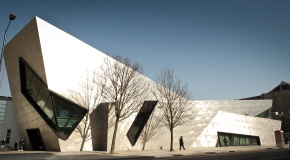 The Open Day is our major showcase for members and to the public who might be interested in joining. 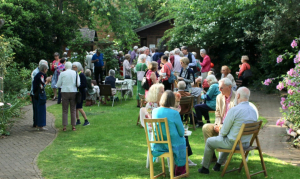 In June we held our annual Summer Party for all members. The venue was the Olden Gardens and it was looking its best. This tranquil haven is a glorious backdrop for our jolly party. All tickets were sold out with 100 coming on this beautiful sunny evening. The booze lasted to the end this year so all were happy, in fact the challenge was getting people to vacate the gardens at the end when our time was up. 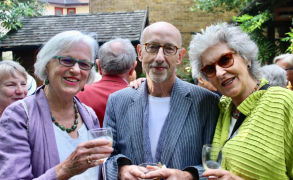 Much socialising and milling around had been possible — to chat to friends and make new friendships. Thanks to Lesley Delacourt for again bringing the bubbly back from France at a very low cost allowing us all to benefit by the low ticket price. 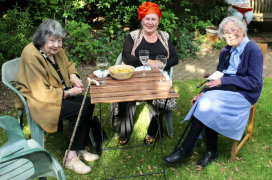 Thanks also to Diane Austin and Sue Welsford for organising this event. But also to all our Volunteers who helped out on the day as well. 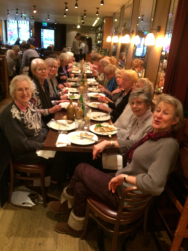 We recently held a 'thankyou' lunch for all our Group Coordinators. 45 attended, a good majority of the total we have. They were all thanked for the efforts they provided in running their groups. Our activity groups make up the majority of what we offer in iU3A, so we are highly dependent on these volunteers. Unlike the annual Group Coordinators' Meeting this was not about training but merely a thankyou. However it still provided an opportunity for the Group Coordinators to exchange ideas amongst themselves and learn about other group activities. While the service was a bit slow the conversation flowed. It was also an opportunity to put a face to a name on an email. All seemed to enjoy the event. 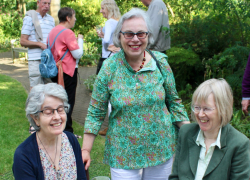 A big thankyou to Sue and Judith for organising the event. Results from the recent (June 2018) Group Coordinators survey can be read here. 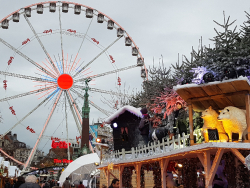 December 2018 — Christmas Market, Brussels: a group of iU3A pioneers enjoyed a wonderful day out in Brussels enjoying sights and sounds of this charming city, the Christmas market, and a very nice restaurant. We took advantage of the very reasonable train fares offered by Eurostar (if one books a few months in advance) travelling to and from Brussels in just over two hours. The early afternoon was spent sightseeing, taking in parks and key buildings whilst meandering in the general direction of the Christmas market. 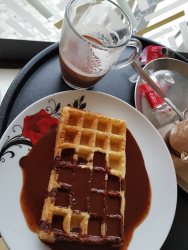 One very important refuelling stop allowed us to sample the famous Belgian chocolate both as a drink and as a waffle topping. 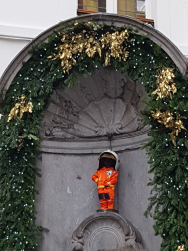 We passed by the Manneken Pis, the Grand Place, the Hotel de Ville, the Eglise St-Nicolas, and the Museum of the City of Brussels finally arriving at the Christmas market. Rather bizarrely the market had a Finnish theme to it and several stalls were selling Finnish goods including whole smoked salmon. There was no shortage of things to purchase, eat or imbibe as one walked around this large market. The far end of the market had a Ferris wheel which offered excellent views of the city. 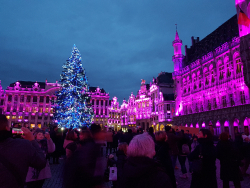 In the late afternoon we reconvened at the La Brouette restaurant in the Grand Place, enjoying a magnificent light show just before we went in to eat. The restaurant was full of character and the meal was excellent, as was the wine and beer. A five minute walk took us back to the local train station which was one hop away from the Eurostar station. A stress-free embarkation with all our parcels and we were whizzing back to London. 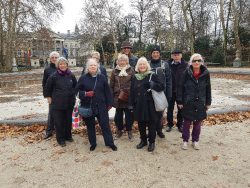 We all had a really wonderful day out enjoying each other’s company and all that Brussels has to offer. 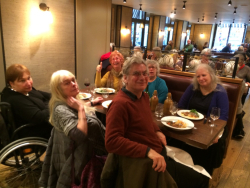 We hope to offer more Outings to cities accessible by Eurostar, based on this very positive experience. Thanks to David McP for all the organisation of this very enjoyable Outing. 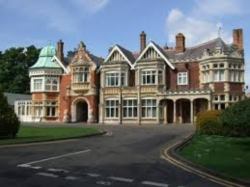 September — a large group of iU3A members headed off to Bletchley Park this month.See the full report with photos here. 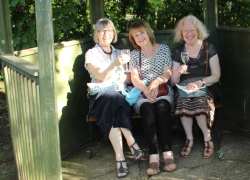 Thanks again to David, Elizabeth and Judith for organising this outing. June — Twickenham: this month our Outing was to two houses in the Twickenham area. A full report can be viewed here. May — Kempton Park Racecourse: the sun shone on the 18 members who embarked upon their researches into the mysteries of the "Sport of Kings". The travel arrangements from Waterloo were, so I'm told, seamless. This set the tone for the day. The Panorama Restaurant, which overlooked the winning post and provided a menu, appealed to all. The opportunity to stand by the Winning Post was taken by many and the excitement enjoyed by the winners was truly infectious. Those few who claimed to be ingenues had luck riding with them; those who claimed some knowledge were deserted by "her Ladyship." As the card ended around 4:30 the journey home was in reasonable comfort. Those who attended all asked for the event to become a regular fixture in the iU3A calendar. April 2018 — Eltham Palace has for centuries been a royal palace, and is now an unoccupied royal residence owned by the Crown Estate. Since 1995 it has been managed by English Heritage, who restored it in 1999 and opened it to the public. 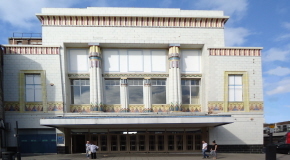 Internally, the Art Deco house is "a masterpiece of modern design". There is also a magnificent Great Hall, a survival from the mediaeval royal palace. There are 19 acres of beautiful gardens, with a rock garden, a moat crossed by London's oldest working bridge and a sunken rose garden. Full report and photos here. Thanks to Angela Treves and David McPhail for organising this one. 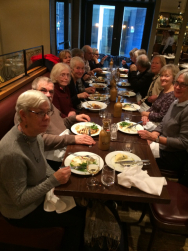 November 2017 — Boating Outing: eleven iU3A members enjoyed a narrowboat trip out of the Islington boat club. We were well looked after by our skipper, Amber, who steered us off in a Westerly direction. 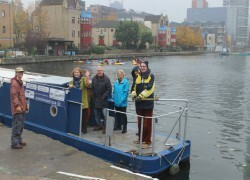 We very quickly negotiated our first lock and then headed directly to the Islington tunnel (more info here). Various members of the group took turns at steering the boat in a good straight line through the 960 yards of the tunnel. This was very much a highlight of the trip. On reaching the Kings Cross side we performed a “u-turn” (a non-trivial exercise) and then went back through the tunnel to Islington. We then headed East for a while before returning to dry land at the boat club. 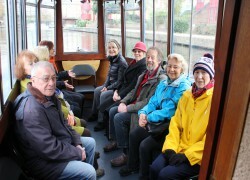 Most of the group then enjoyed a drink at the Plaquemine Lock pub (more info here) where there was a live jazz band. We hold these at least once a year. These are in addition to our two Theatre Groups that we have (for more information see the GROUPS page. In December 2017 we had another successful annual outing to the Park Theatre at Finsbury Park. We saw a revival of Joe Orton's wonderful black comedy Loot, which opened one week after the 50th anniversary of the playwright's tragic death. Over 106 iU3A members (& friends) attended this enjoyable evening. The talk before the play from the director to iU3A give us some special insights into the changing values and views from its original production. Again, many thanks are due to Sue Welsford for organising this event. We're into 2018 and planning for two of these popular events during this year. The first of these was held in June and the second in September. For the June one a warm Sunday meant a very pleasant event with three teams this time (numbers a bit down from the last one). This one was based again around the city and followed byways and alleys that most people didn't even know existed. Great views over the river at one point. Most teams got the majority of the clues and got back to the starting & finishing point pub in good time. However the photo images were the differentiating aspect. No team spotted all the images during their route but the 'Poached Eggheads' saw the most and hence were the winning team. The September one (arranged by Elizabeth Mansbridge) saw us in a new area for this Clues Trail — Canary Wharf. While the image might be of tall skyscrapers and not much else, we discovered an amazing collection of street art, historic corners, and interesting architectural features. Numbers attending were a bit disappointing considering the effort put in to organise these events. But maybe a Friday just coincides with too many other iU3A activities. In 2017 — in August on the day 22 members turned up to form five teams, then followed the trail to seek out the clues. 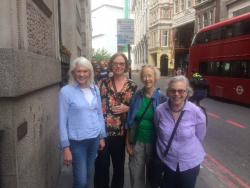 Additional points were awarded for spotting the location of some photographic images during the trail and a special round at the end back at the pub tested teams' knowledge of the London Guilds. Again everyone thoroughly enjoyed the event. Thanks to Elizabeth Mansbridge for organising this one — and we all look forward to the next one. We've a few ways to help our members grapple with technology. Firstly — our drop-in help sessions: these are a regular feature in iU3A now. These drop-in help sessions allow iU3A members with any query they have regarding their computers, tablets or smartphones to drop in and receive guidance from other iU3A members. 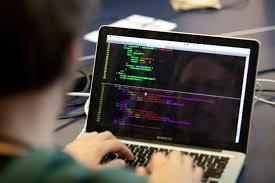 They are generally held every two to three months with members requesting help with a variety of query areas. Some of these are simple (to some) and were easy to give guidance on, others were harder to solve with much cross-learning and use of Google search. 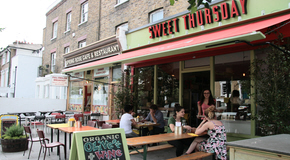 All the "customers" go away very contented and with increased confidence to try things for themselves. Thanks again to all the volunteers who came along to share their knowledge with other iU3A members. See the 'What's On' page for details of the next of these sessions (if there is one scheduled). Secondly — our Help Line: If you can't make the drop-in sessions or need a quicker service then for any help with your computer, tablet or smartphone you could try our help line. Send your query with details to computerhelp.iu3a@gmail.com. We will share out between our iU3A experts and provide you with an answer, hopefully solving your issue. Thirdly — Tutorials: we have a general tutorial on some points raised previously here. But we are about to launch a programme of these classroom style events. We will cover a variety of specific topics and cover the subject from a 'no-knowledge' to a more advanced level. More details to be published shortly. Previously: To see more of our previous events and outings look here.